Come and enjoy this classic kiwi bach. Situated on the beachfront in Mount Maunganui, this cute cottage has everything you need for a relaxed stay. The beach is only a short walk away to enjoy water sports such as swimming, boogie boarding and kayaking. It is also located within walking distance to Bayfair shopping centre, Baywave indoor pools, and a skate/scooter park. Mount Main St is only a 10-minute drive away to enjoy the cafes, shops, hot pools, and cinema. Tauranga is also only a 15-minute drive away. Please note this property will be rented out to families or professionals only. AIMS GAMES: Please inquire if you have a team participating in AIMS games. Our neighbours 3 bedroom house is also available so you could fit a team between our two homes. Fall in love with the view. Separate bathroom (shower and sink) and toilet. 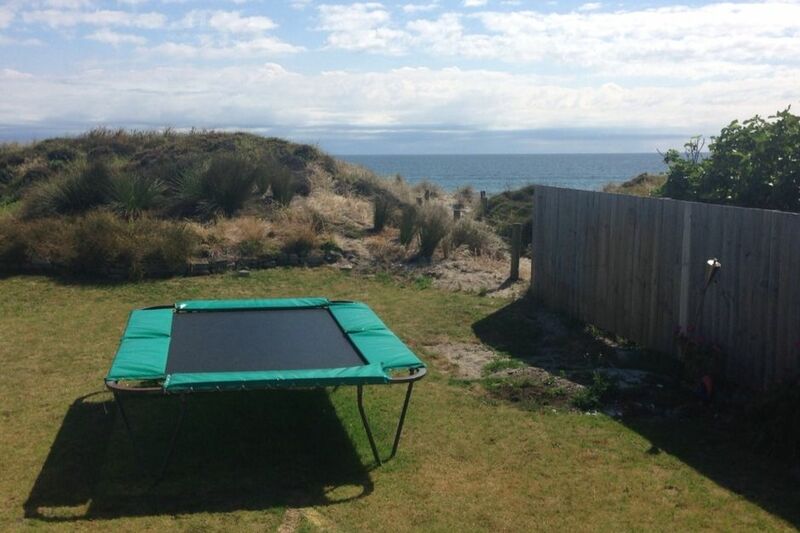 Cute, original beach front cottage only meters away from Mount Maunganui beach. Parking for one car on the grass in front of the shipping container. Plenty of offroad parking. Guests can come up and park behind your car when visiting. Breakfast bar scenario inside and outside we have a table with 6 chairs. Can have the spa running for you during your stay, but you may need to place some products in it every few days depending on use. We will have the spa products available. Could not rate this spot any higher. Could not rate this spot any higher. We had an amazing family holiday. A Bach that makes you feel at home and relaxed. Travelling with kids can be nerve racking but everything was there and so easy. A traditional bach in a wonderful location, with a few mod cons for comfort (Sky TV and Air Con), no dishwasher but everything else you need in the kitchen. Great outdoor flow, onto a good size deck with a good sized out door table. The kids loved the tramp and the beach access is right there. The only thing I would recommend changing is the curtains so they close properly and the kids can sleep in more, otherwise the owner has made a bachy bach quite funky and functional would recommend.